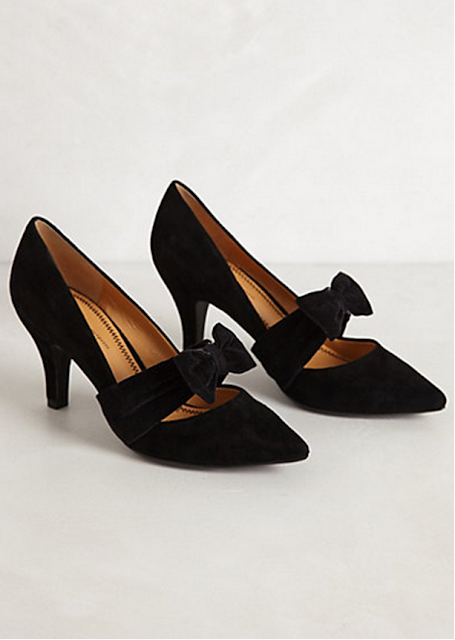 Today's So Shoe Me is the Maggie Velvet Pumps, $148, available at Anthropologie. Get a fashion bowner for these prim and proper pointed pumps in a dark and decadent velvet. A dainty little bow adds a sweet feminine detail to this classic high heel. The mid height heel is perfect for work or play and the pointed toe elongates the leg so you'll feel long in this petite bow accented style. Pair these chic little heels with a glossy dotted shift dress for a mod 60s silhouette that's ready for a dressed up night out. So Shoe Me a pair of pretty and petite bow accented heels that will add a dressed up detail to the classic little black pump.